Investor and entrepreneur Richard Koch and venture capitalist Greg Lockwood show how the best businesses in the world achieve amazing success by simplifying in one of two ways: via price or proposition. The authors offer step-by-step plans for how to simplify using these two strategies and also outline the traps that lead managers to avoid simplifying. Don’t chase success by making things more complicated. Instead find out how to win by learning how to simplify. 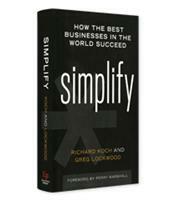 Why simplifying a business or market is the key to exponential growth. The key differences between simplifying price and simplifying proposition. How companies like IKEA and Uber have simplified to crush the competition. To recognize warning signs from simplifying competitors.